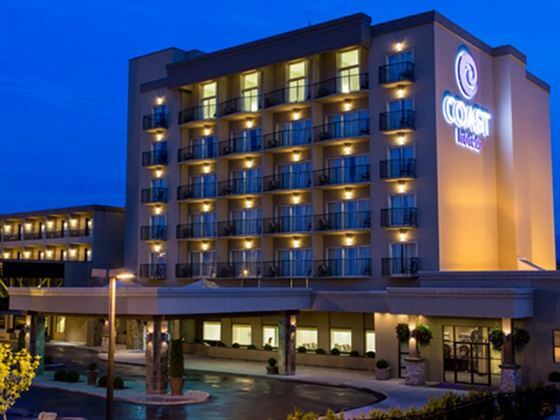 The Coast Capri Kelowna Hotel offers a convenient location near the city’s most popular attractions and a wealth of restaurants and shops. 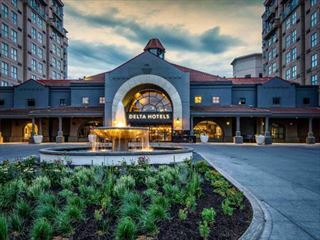 In fact, it sits near some of the best nightlife, entertainment, dining and shopping Kelowna has to offer. It's also only a ten minute drive to the lakeside beaches and an easy drive to several of the lovely parks. This family-friendly property provides a complimentary buffet breakfast to help fuel guests for a day of exploration, as well as a full-service spa for unwinding later. 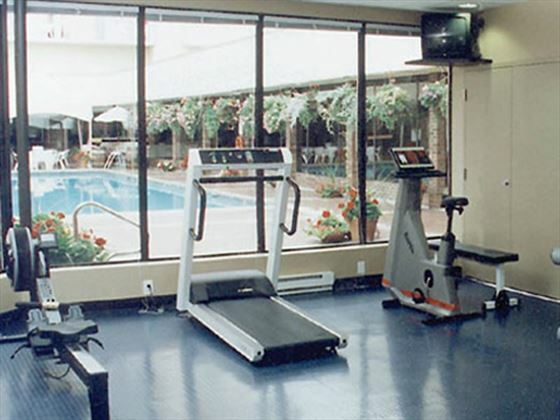 If you didn’t get enough exercise while you were out and about, you can take advantage of the 24-hour fitness center, and follow it up with a relaxing swim in the outdoor heated pool, or indulge in drinks at the poolside bar. In the evening, head to the onsite Vintner’s Grill, which features a diverse menu of cuisine that can be paired with local and international wines, and enjoy listening to live jazz and blues on Friday and Saturday nights. Comfort Room Queen – The Comfort Room Queen has 230 square feet of space and includes one queen-size bed with triple sheeting and a balcony or window that opens. Comfort Room King – The Comfort Room Queen has 250 square feet of space and includes one king-size bed with triple sheeting and a balcony or window that opens. Comfort Room Double Double – This 250-square-foot room includes two double-size beds with triple sheeting, a balcony and a pool view. 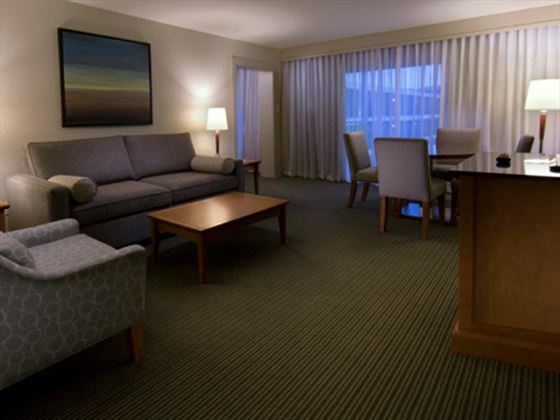 Comfort Room Queen Queen – This 250-square-foot room includes two queen-size beds with comforters and a balcony. Comfort Pool Double Double Room – This 250-square-foot room is located on the ground floor and includes two double-size beds with triple sheeting. It also features a balcony and exits to the pool deck. 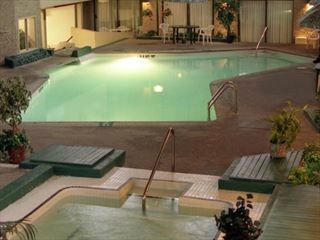 Comfort Pool Queen Queen Room – This 250-square-foot room is located on the ground floor and includes two queen-size beds with triple sheeting. It also features a balcony and exits to the pool deck. 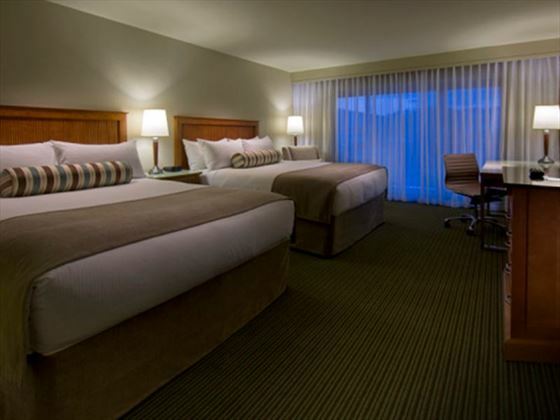 Superior Room King – The Superior Room King offers 255 square feet of space and includes a king-size bed with triple sheeting. It also features a balcony and a pool view, terry cloth bathrobes, upgraded bath amenities and an ergonomic desk chair. 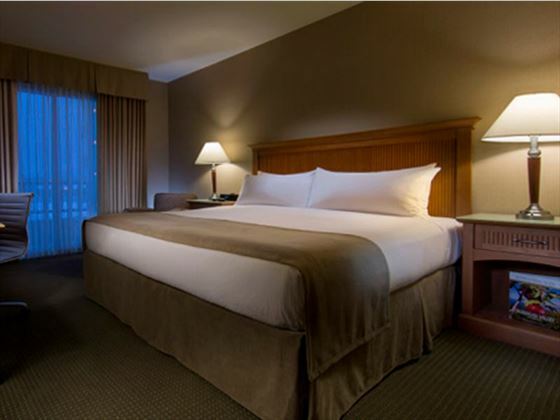 Superior Room Double Double – The Superior Room Double Double is a 280-square foot room that includes two double-size beds with triple sheeting. It also features a balcony, terry cloth bathrobes, upgraded bath amenities and an ergonomic desk chair. 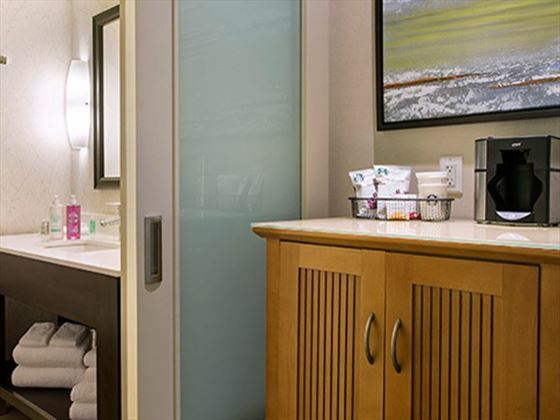 Superior Room Queen Queen – This 280-square foot room includes two queen-size beds with triple sheeting along with a balcony, terry cloth bathrobes, upgraded bath amenities and an ergonomic desk chair. Premium Room King – The Premium Room King has 345 square feet of space and includes a king-size bed with triple sheeting as well as a queen pull-out sofa bed. 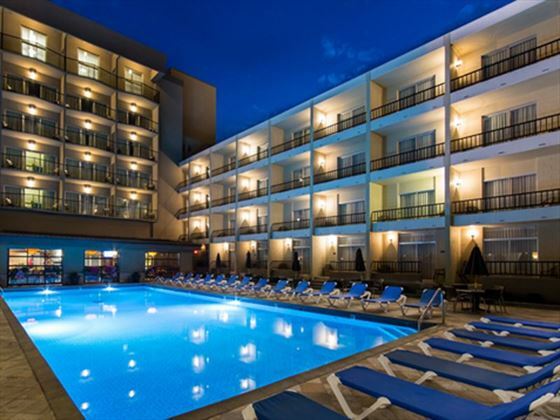 It offers a pool or mountain view, a balcony, terry cloth bathrobes, upgraded bath amenities, an ergonomic desk chair and a business tray. Premium Room Queen Queen – This 345-square-foot room includes two queen-size beds with triple sheeting, a pool or mountain view, a balcony, terry cloth bathrobes, upgraded bath amenities, an ergonomic desk chair and a business tray. Premium Suite King – This suite includes a king-size bed with triple sheeting in a separate bedroom as well as a queen pullout sofa bed. It features a pool or mountain view, two balconies, and a television in both the living room and bedroom. It also includes terry cloth bathrobes, upgraded bath amenities, an ergonomic desk chair and a business tray. 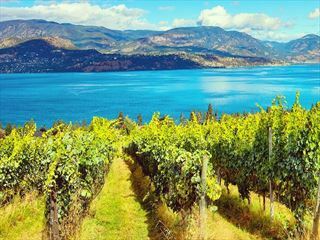 The Coast Capri Kelowna hosts Vintner’s Grill that has both an indoor eating area and an enclosed patio with open-air access. It also offers live entertainment on Friday and Saturday evenings. The Coffeecopia Gourmet Coffee Bar is also onsite, located in the lobby, and serves a selection of gourmet coffees, teas and other beverages as well as items like sandwiches, pastries, fruits, salads and cereals. This property is located less than 8 miles from the Kelowna International Airport, just blocks from picturesque Okanagan Lake and within a mile of Capri Mall, Okanagan Heritage Museum, Kasugai Gardens and Guisachan Heritage Park.